Anna Julia Haywood was born in Raleigh, North Carolina, on August 10, 1858. Her mother, Hannah Stanley Haywood, was enslaved to the family of her father, George Washington Haywood: “My mother was a slave and the finest woman I have ever known…. [M]y father was her master, if so I owe him not a sou.” Anna took up her life’s vocation, “The Education of neglected people,” at an early age. She was only about ten years old when she received a kind of work-study scholarship to attend St. Augustine’s College, a school for former slaves and their families, while assisting the school as a math instructor. There she was a student of both liberal arts and sciences and won the right to study Greek and other subjects traditionally reserved to men. At St. Augustine’s, she also met and married George Cooper, a professor of Greek and the second African-American in North Carolina to be ordained an Episcopal priest, only to lose him two years into their marriage. She never remarried and dedicated her life to scholarship, education, writing, speaking, activism, and mothering orphaned children. Anna Cooper earned her bachelor’s degree in mathematics in 1884 from Oberlin College, where poverty forced her to live off-campus in the home of a professor. Once again, she had to win the right to take subjects reserved to men. She earned a master’s degree from Oberlin in 1887. After college, she returned to teaching math, science, Latin, and Greek and became a renowned public speaker. Cooper was one of only two women to speak at the 1890 Pan-African Conference in London, and one of few African-American women to speak at the World Congress of Representative Women at the 1893 World’s Fair, the racism of which she did not hesitate to criticize. Cooper’s most famous written work, a collection of speeches and essays on subjects including women’s rights and racial progress called A Voice from the South, was published in 1892. In what is by far her most quoted essay, “Woman Versus the Indian,” Cooper respectfully but forcefully warned fellow feminists, especially white feminist leaders, that they must not take too narrow a view of their mission. Their true cause, she wrote, could not be reduced to the enfranchisement and empowerment of women; they must not set themselves against other people, even for a moment, but must promote the dignity and equality of all people. Oppressed and marginalized people should be allies in their work for justice — this, she believed, was the only way feminist goals can truly be achieved. After five years teaching at Lincoln University in Jefferson City, Missouri, a new superintendent asked Cooper to return to M Street School in Washington, where she would teach until her first “retirement” in 1930. Her academic efforts allowed many young women and men of color to gain admittance to prestigious colleges and universities even before desegregation. During her second tenure at M Street, Cooper created a YWCA chapter of the Camp Fire Girls. 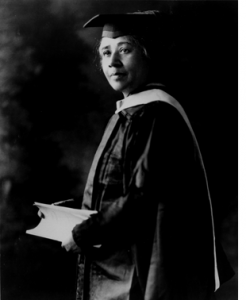 She also began her doctoral work at Columbia University but put this on hold when, at the age of 57, Cooper adopted five children orphaned by her relatives in 1915. Cooper’s own home at 201 T Street NW was, like her previous home on 17th Street, “not merely a house to shelter the body, but a home to sustain and refresh the mind, a home where friends foregather for interchange of ideas and agreeable association of sympathetic spirits.” Cooper not only raised children in this home, she also entertained and collaborated with literary friends, such as the Grimkés, and taught high school-level business courses as well as college-level classes in the liberal arts and sciences to working-class African-Americans through Frelinghuysen University. In 1925, at the age of about 66 years, Cooper defended her French-language doctoral thesis, “The Attitude of France Toward Slavery During the Revolution,” at the Sorbonne in Paris, becoming the fourth African-American woman ever to earn a Ph.D. When she retired from teaching at M Street High School, Cooper became the president of Frelinghuysen University for a decade, renting her home to the financially insecure school when it could not afford space elsewhere, and continued there as a teacher and registrar until 1950 — just eight years shy of her 100th year. She was still writing and publishing. Anna Julia Cooper died on February 27, 1964, ten years after Brown v. the Board of Education desegregated American schools, three years after the freedom rides began in Washington, and not a full year after Dr. Martin Luther King wrote his famous Letter from a Birmingham Jail. She was 105 years old. A memorial was held at St. Augustine’s College in Raleigh, and Cooper was buried next to her husband in the City Cemetery.